Local garage door repair technicians near you Contact us today! Many things can go wrong with an electric garage door opener system - after all, it is composed of many parts and used several times a day. If yours has stopped responding or seems to be functioning unpredictably, we're the nearby experts who can help troubleshoot the issue and repair the problem. As a first step, it never hurts to double check whether or not the opener is connected to the power. Most definitely, the electrical unit won't work if it's not plugged in or if there is a power failure and you don't have a backup battery. Similarly, if you're not getting any result when using your remote control, it is also worth confirming it isn't a problem with the controller (or the batteries). The first task is always to determine the origin of the problem. Since the opener system contains a sensor reverse mechanism and a limit switch, these two functions should be checked first for issues. It can be difficult to ascertain exactly where the problem lies, seeing as an electric opener is a complex device with both mechanical and electrical components. Rest assured that by contacting Garage Door Repair Bothell for assistance you're reaching out to the nearest experts who have years of experience solving all sorts of opener problems. The limit switch makes sure the overhead door opens and closes all the way. So, when the door fails to reach its full closing or opening position or seems to slam shut - the problem may be connected to the limit switch. The reverse mechanism will be activated even if so much as a few tree sticks are found under the door. In such cases, it is worth checking that the floor and sensors are clean. Dirty sensors can cause a door to open up again because they think there is an obstruction in the path of the door. If your opener has started to become a lot noisier, this could indicate a failing motor gear or a problem with the electrical circuit inside the opener. If you suspect either of these two things to be the issue, you should contact our specialists right away. If your gear completely fails, your opener will stop responding. Problems can also occur if wires have accidentally been cut or if the communication between the opener and clicker has been lost. When you're experiencing problems with your opener, don't hesitate to get in touch with our team to have a service specialist come to your house today and take care of the problem for you. Why is my garage door opener remote not working? If your remote doesn't seem to be working, try changing the battery. We’re not joking. You’d be surprised how many times that’s all it takes. Of course, there are plenty of other reasons why your remote doesn’t work, this is simply the basic and most obvious one. If replacing the battery doesn't work, check to make sure the opener is functioning by trying the wall switch. If the opener works via the switch and you've changed the battery in the remote, then you may need to replace your remote. If the opener isn’t working even when you use the wall switch, then some expert troubleshooting is necessary. 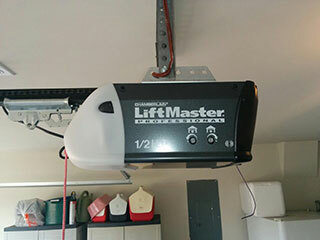 If your garage door opener seems to be acting up, there are a few things you can try to get it working again. Make sure your door is in order by trying to open and close it manually. If this works, it's not the door and probably the opener that’s malfunctioning. Check the wall panel switch. If your door works, then the problem is most likely with your remote. If not, you may need to check the power supply of your opener, or the drive system or internal components of the unit itself.